This presentation takes the form of a performative reading accompanied by a short film. 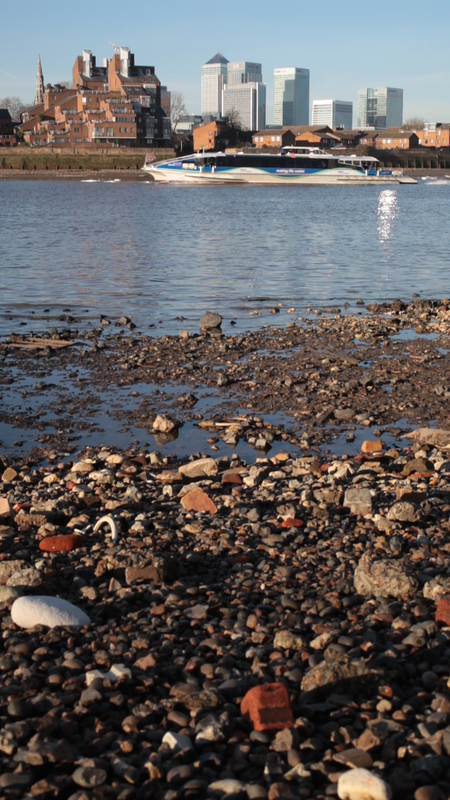 The context of the work is the foreshore at Greenwich where the River Thames is framed by the historical monuments to Britain’s past maritime power on one bank and the current financial district of Canary Wharf on the other. Here, the river continually throws up osteo artefacts, the ‘waste’ remainder of industries which once lined the southern shore. ‘Wandering Shards’ explores the uncanny pull of these objects not through a drive to archive or establish a fixed osteo -archaeological identification, but rather to consider their attraction as transformational objects that conjoin with the dynamics of the river and our own organic past and present. The presentation further suggests that through the acts of writing, speaking and visual imaging, overlooked ‘remains’ can be considered to generate imaginative and material renewal, a practice of ‘bringing to life’ which is inherently contingent. Susan Trangmar is an artist living and working in London and the south east of England and is currently Reader in Fine Art at Central Saint Martins. She is interested in how local material factors of geography, nature, human inhabitation and climate can be understood through artistic practices of space, performative event and temporality explored through lens based media, sound and writing.